On the first day of culinary school, as a silly get to know your classmates exercise (before you start burning each other and setting things on fire), we each said what our last meal would be. 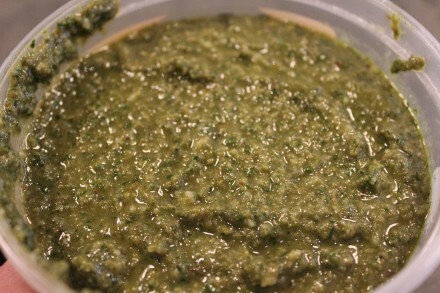 My Mom’s pesto made its way into every one of my courses. It can pretty much go on anything, pasta being the obvious choice, but it is great on roasted chicken, grilled cheese, tomatoes and mozzarella, a spoon…I could go on all day. 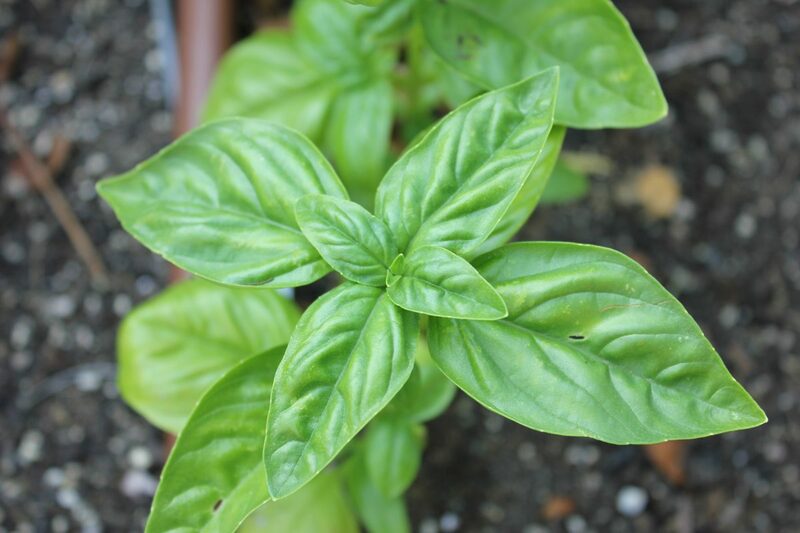 The most time-consuming part of this recipe is washing and drying the basil as it tends to attract a lot of dirt. A salad spinner is the most efficient method of drying but if you do not have one, put the washed basil in a towel (or pillowcase) and, standing outside or in the shower, spin it around. It sounds ludicrous but it is amazing how much water will come out that way! 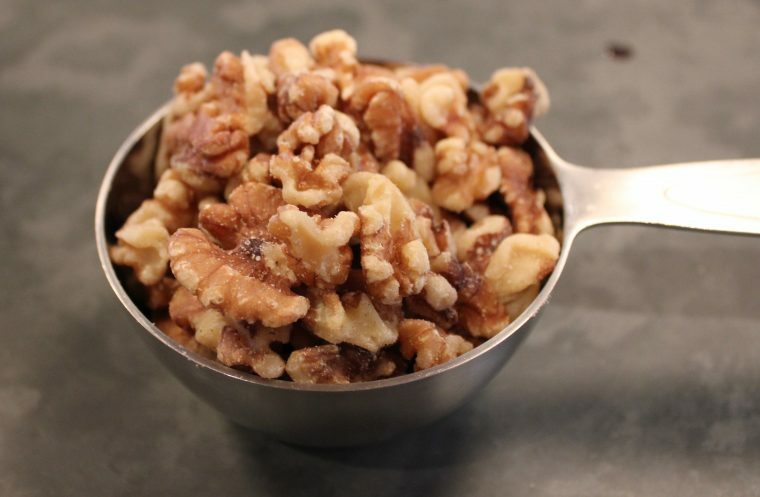 The majority of store-bought pestos use pine nuts; personally I much prefer the walnut flavor, but feel free to use pine nuts or to experiment with any other nut you like! 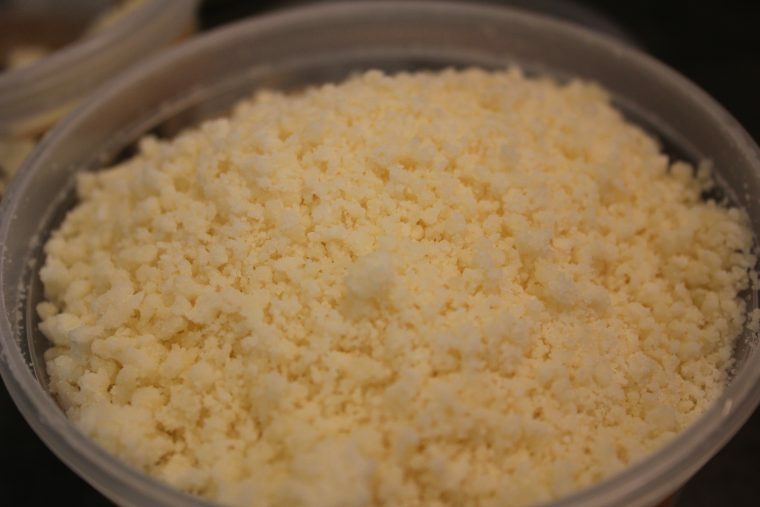 Parmigiano Reggiano is a hard cow’s milk cheese with a sharp nutty flavor. Under Italian law only cheeses made in the provinces of Parma, Reggio Emilia, Modena, and Bologna, may be labeled “Parmigiano Reggiano”. Outside of Europe, imitation cheeses are labeled under the generic name Parmesan, which can vary greatly in quality and flavor – with cheese I find you really get what you pay for and the bargain buy is rarely worth the cost. Pecorino Romano is an Italian sheep’s milk cheese that adds a great saltiness to the pesto. If you can not find pre-grated Parmigiano and Pecorino, it is very easy to grate both in the food processor with the blade attachment. 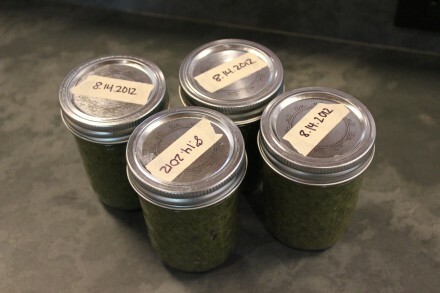 Freeze your extra pesto for at least 6 months and defrost in the fridge when ready, just make sure to date each one!! 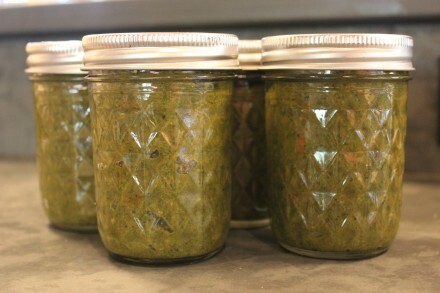 Combine the basil, garlic, and walnuts in a food processor, fitted with the blade attachment, and pulse a few times to chop. With the motor running, drizzle in the olive oil - this will allow the oil to emulsify with the basil mixture so it won't separate out later on. Scrape down the sides of the bowl, add in the two cheeses and pinch of salt and lots of pepper. Store in the fridge only what you will use in the next month or so and freeze the rest. Yum, will definitely be making this!! Thanks for easy-to-follow directions.